Last night the first two Discovery episodes had their premiere at the Arclight Cinerama Dome in Hollywood, and many of the Discovery cast and Star Trek alumni were there to watch and celebrate. Two moments really caught my eye though, so I'm going to look just at those. 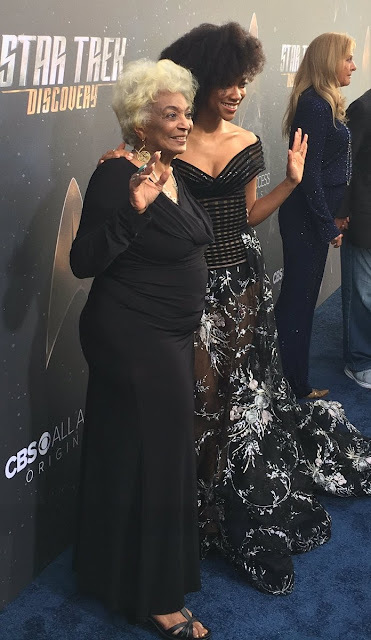 First up, the great Nichelle Nichols (the original Uhura of course) tweeted a photo of herself with Sonequa Martin-Green (the star of Discovery, Michael Burnham). I'm in two minds about what this meeting symbolises. 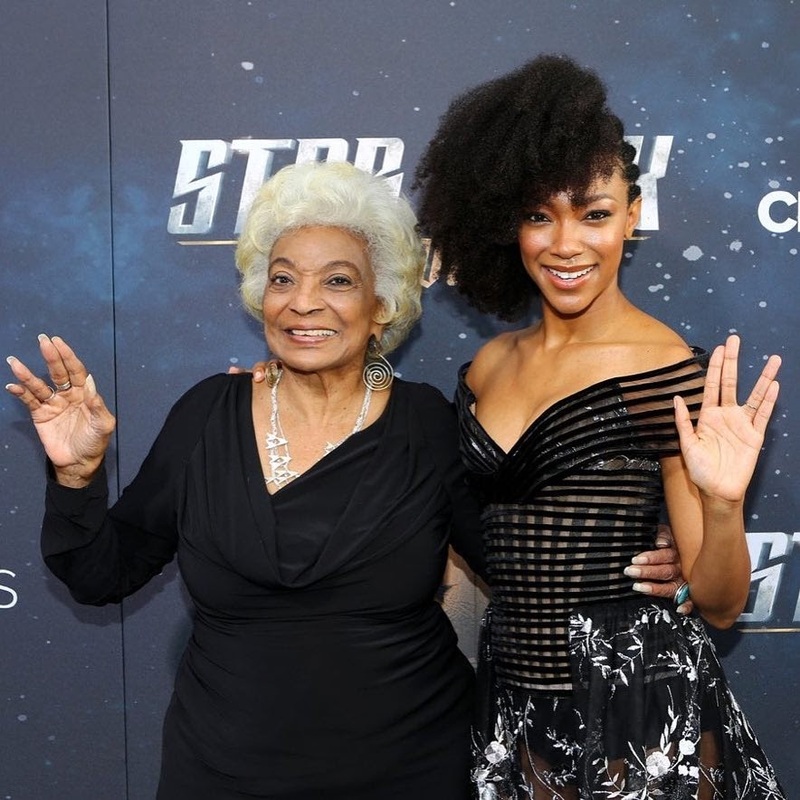 Part of me is simply delighted to have these two black women at the heart of Star Trek. But part of me is also saddened that fifty years after Uhura sat on the bridge of the Enterprise it remains remarkable to have a woman of colour be a lead in a major TV series. I'm proud Star Trek is continuing to push for better representation, and can only hope this continues to be normal in future, not the exception. The second images that really struck me emphasises why having better representation matters. 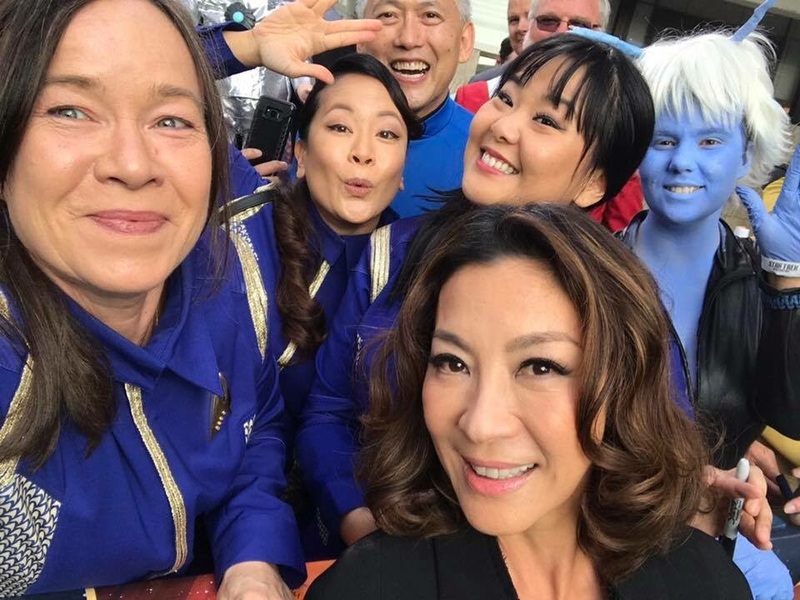 Here's a image posted by comic book artist Leen Isabel, featuring herself and two others in Captain Georgiou cosplay, with none other than the captain herself, Michelle Yeoh, posing with them. 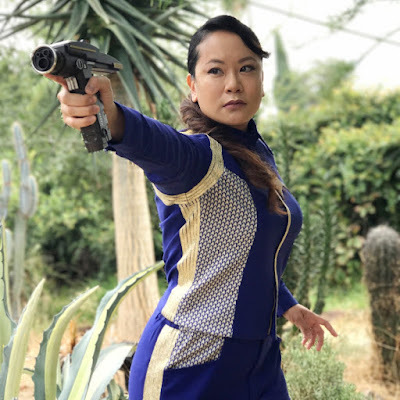 I don't known the mind of Isabel, but I think this illustrates a point beautifully; that people from every background desperately want to be includes in the shows they love, and so show how damned important it is to have Yeoh being an all too rare Asian face in Star Trek (or indeed any other major series). Of course there is one other major representation win in Discovery, which sadly I've not found a good illustration of. This series will also prominently feature a gay relationship, between Anthony Rapp's Paul Stamets and Wilson Cruz's Hugh Culber - This is something that has been sorely missing from Star Trek, and so to have it now be one of the core relationships in the series is massively overdue and very very welcome, for much the same reasons as the racial representation noted above. Star Trek: Discovery is due to start in a few days, and it will be distributed almost everywhere in the world on Netflix, except for the US where is will be available on CBS All Access, and Canada where it will be on Bell Media channels and services. To keep track of all the latest details from the new show, visit my Star Trek: Discovery guide page.